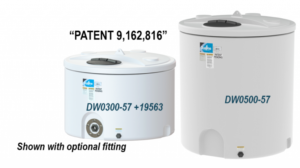 Dualline™ Double Wall Tank’s strong, durable, quality construction is designed for the containment of all chemicals rated for contact with polyethylene. Dualline™ tanks are freestanding double wall vertical tanks with a flat bottom for indoor or outdoor stationary applications. Double wall construction provides containment in the event the inner or primary tank is compromised. AN EPDM elastic seal is standard and seals the primary tank to the secondary tank to prevent dirt and moisture from entering the containment space between tanks. Furnished with a 16” vented lid assembly as standard. A 1” service fitting is provided on the secondary tank in the event that the containment requires evacuation. Standard colors are white, yellow, and black. Consult factory for optional colors. with a specific gravity of 1.7. Consult the Application Guideline Manual for known compatible chemicals and service temperatures. FDA compliant materials are available. Furnished with a 2” polypropylene fitting with santoprene gasket and 316 stainless steel compression rings. Note that optional fitting must be factory installed. Accessory not sold separately. Consult factory regarding fitting and gasket options.